Hermione Gingold is probably best known for her performances in the films 'Gigi', 'The Music Man' and 'A Little Night Music' - however her career originated in London revues of the 30s and 40s. Her popular appearances in revue created a back catalogue of signature songs which Hermione would regularly perform. 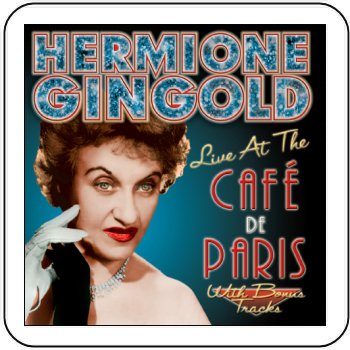 Hermione later found success in America but returned to London in 1953 to perform at the Cafe De Paris. This live performance has remained unreleased until now. The bonus tracks featured are selections from Gingold's solo album 'La Gingold' and duets with Gilbert Harding.